Speaking of previously-unknown NES ports, Digital Press forums member mrmark0673 has located a work-in-progress port of Elite Systems‘ computer game Hoppin’ Mad (itself an expanded update of budget title Cataball). To my knowledge this game was never announced in any publication, and is an entirely new discovery. 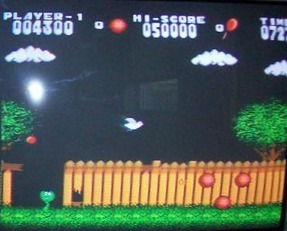 The build itself, according to mrmark0673, has complete renditions of the first two levels of the original game, with the third playable but missing enemies. The post was made on Digital Press just today, so watch the thread if you’re interested in learning more.